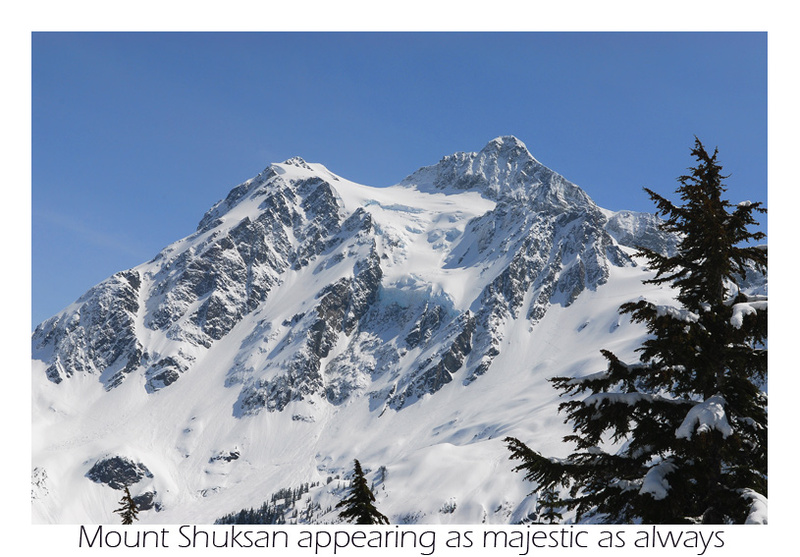 Mount Shuksan is not only a fascinating mountain, but also a mammoth hunk of rock and ice more complex than any other non-volcano in Washington. Reading up on the history of the mountain, I was thrilled to discover that the first ascent (according to the Cascade Alpine Guide) was done in September 1906 by Asahel Curtis and W Montelius Price, via a "...far southwestern face." It is my belief that this was by a route we descended in 1999 after climbing the route marked in Blue above. 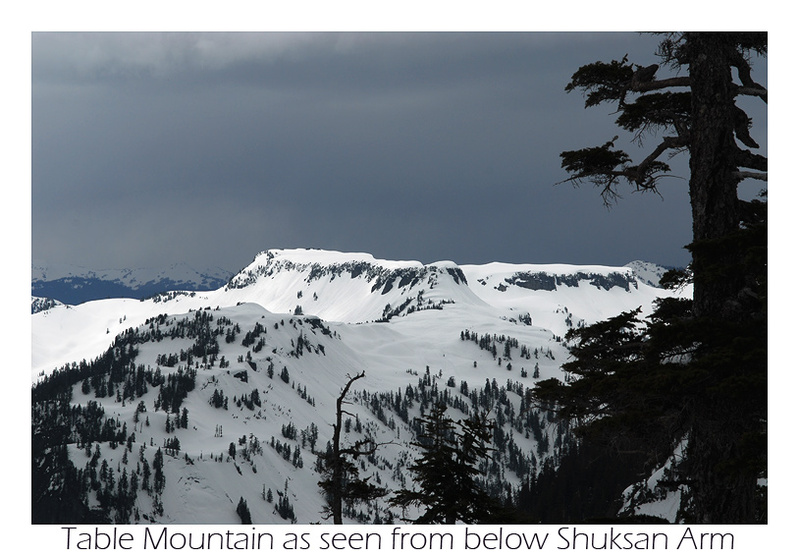 It offered easy access from the Sulphide to the valley below. 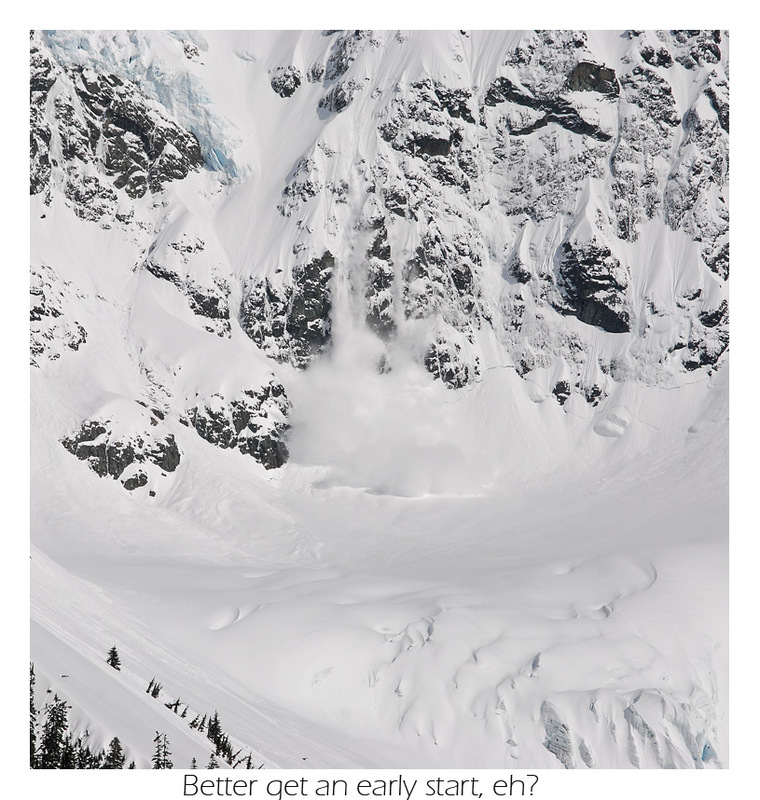 Further, in the Cascade Alpine Guide, Becky shows a route that is called the West Face, but on closer inspection I see that it connects to Hells Highway, not the Sulphide. 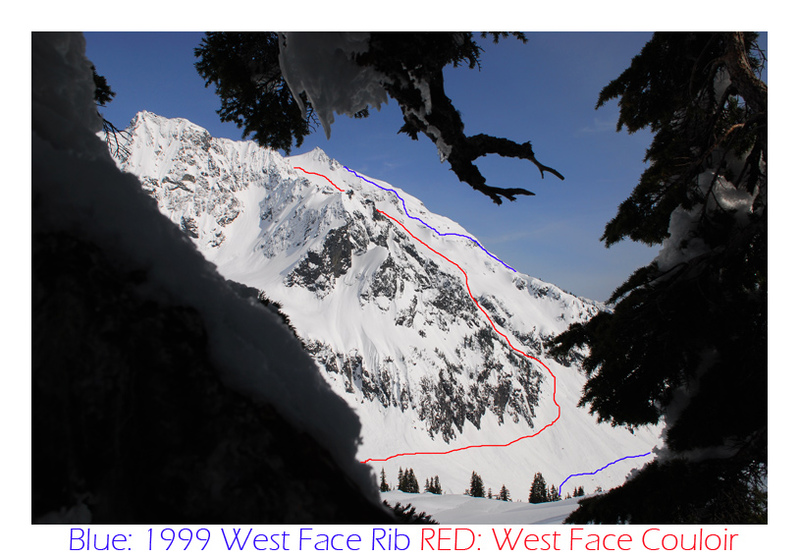 Many years ago my friend Ben had called the Blue Line (marked above) the West Face, although it may more appropriately be called the southwest face. 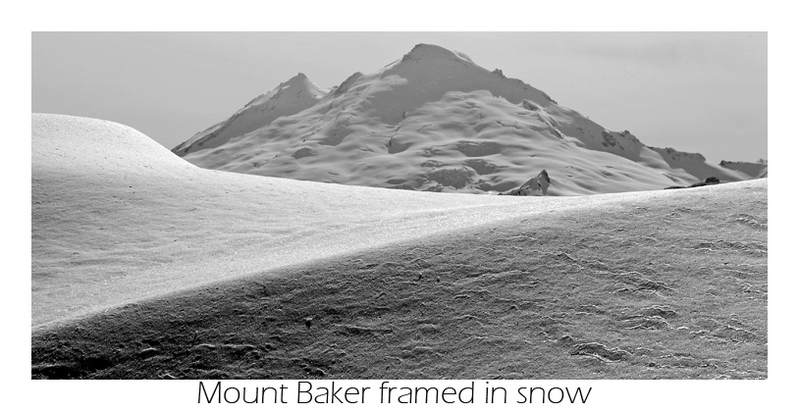 With little known about this side of Mount Shuksan, I couldn't help but wonder, "Why so ignored?" The two routes I've climbed rise four thousand to forty-five hundred feet out of the valley. That is by no means insignificant, but with no mention of it anywhere I've found, there must be a reason? 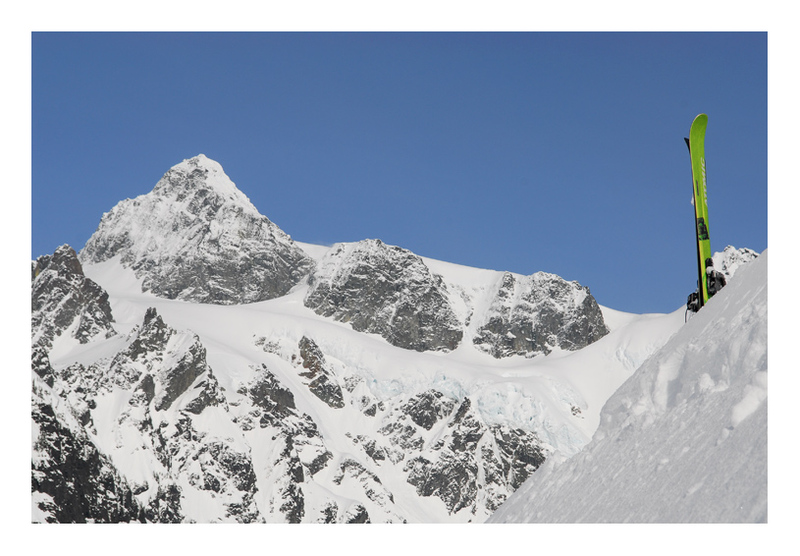 My best guess is that with so many fine routes on this mountain climbers choose to ascend the North Face, Price Glacier, Sulfide, White Salmon, etc. 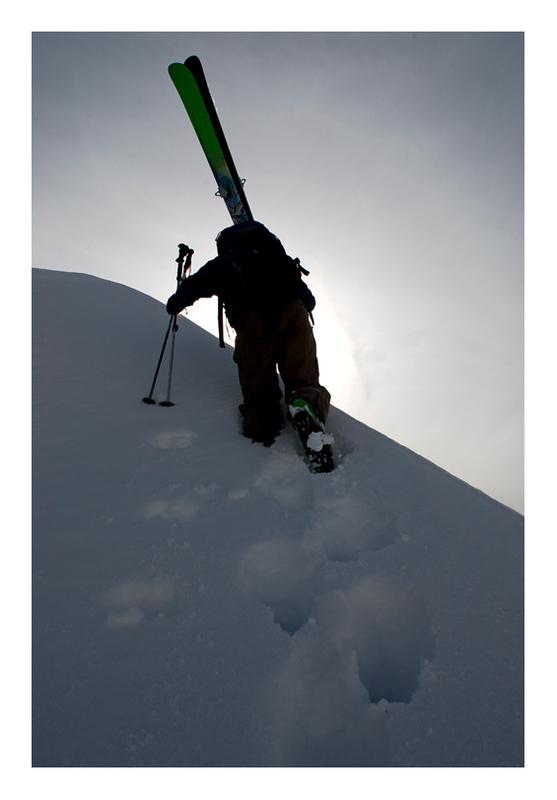 As a skier though, part of my thrill is finding routes that are good for skiing and not just climbing. 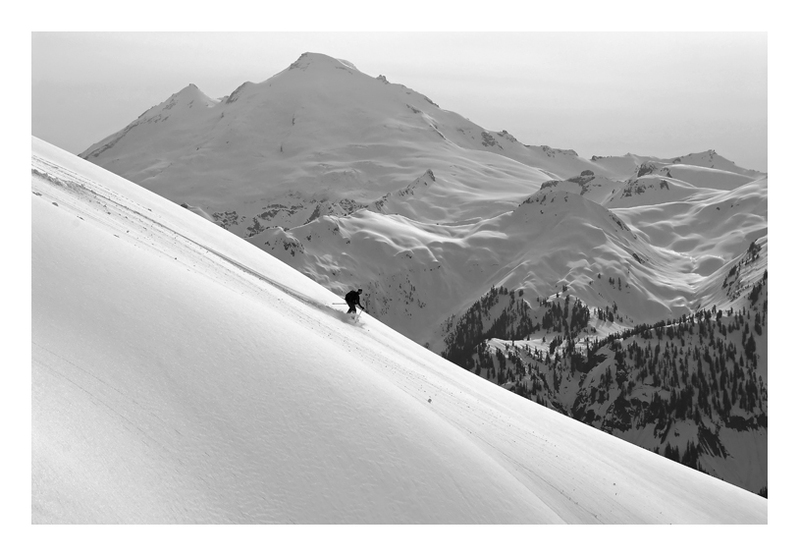 Ski mountaineering, for me at least, involves steeper routes where both skills, skiing and climbing can be commingled and employed in a genuinely exciting way. It doesn't need to be death-defying to be fun, but it does need to be challenging. 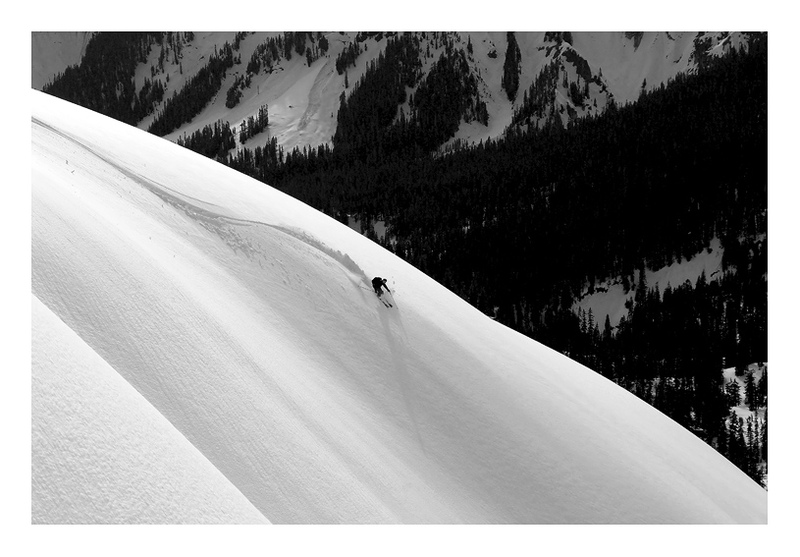 With the combination of approach, timing, and route I think you'll find a fine ski mountaineers route on the West Face Couloir (for lack of a better name). 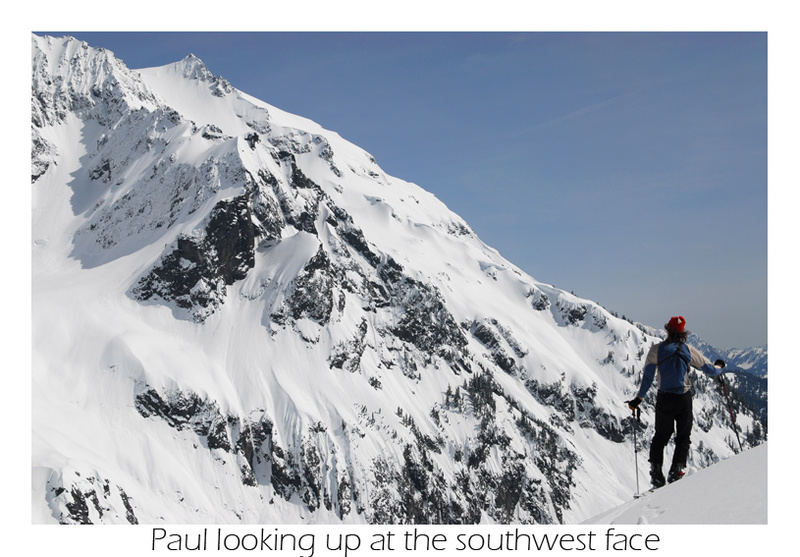 Dave was shown the west face by Sky when he climbed and skied a variation of the Curtis Glacier. Sky had been talking of going there for a long time, and so had I. 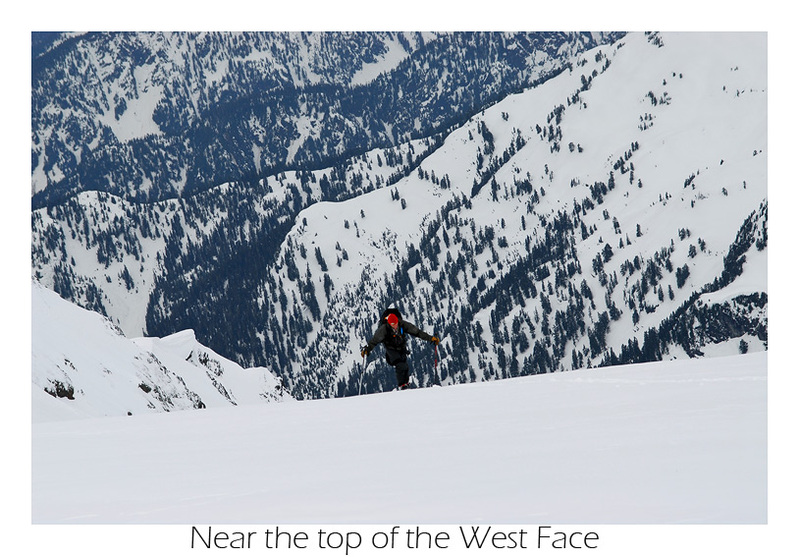 In fact, when they had gone to ski the Curtis, they had gone to attempt the west face. This didn't work out. But that didn't matter. 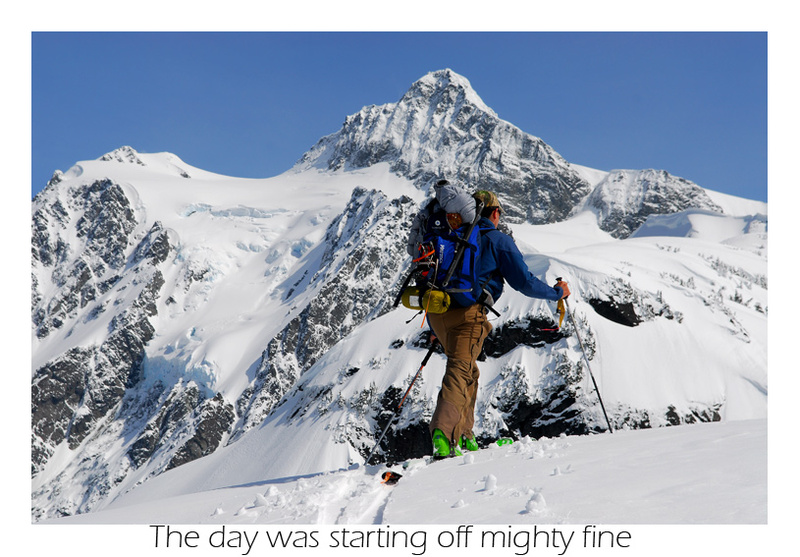 They skied a wonderful line in a long day, a practice Sky is famous for (leave the tent, bring the coffee). This was not to Dave or my taste, especially given the fact I'm driving from Tacoma. We decided to leave saturday and climb sunday. I left Tacoma at 8 a.m. with a full night's sleep under my belt. I felt like something was wrong, like I'd cheated myself, but then I cranked up the music and cracked open the window and I felt alright. 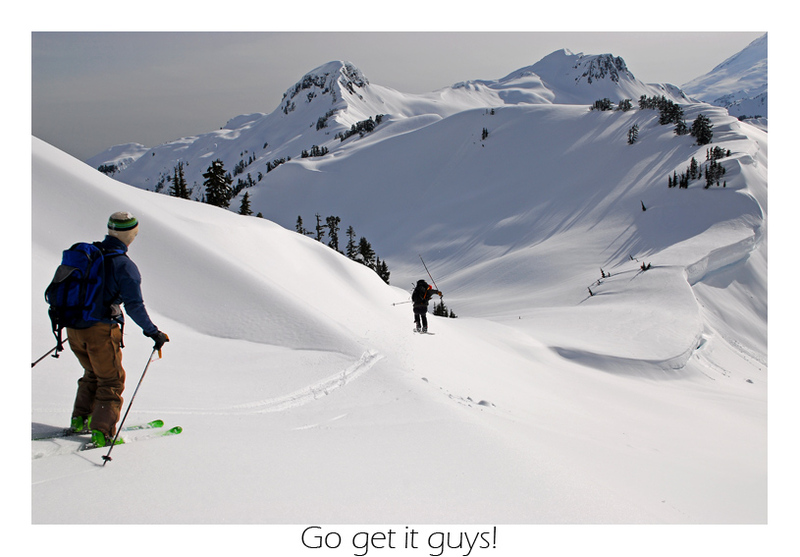 I haven't skied with a lot of people, but I've been trying to change that. On this trip I was not only joined by Dave, but by his friends Ryan and Paul, both college students of WWU and UW. 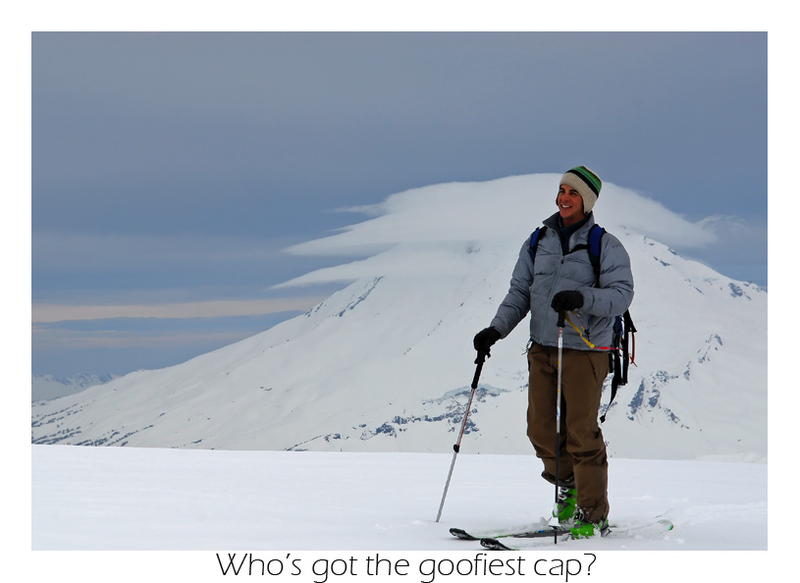 It was fun to ski with some of the younger skiers, who spend more time skiing than studying. 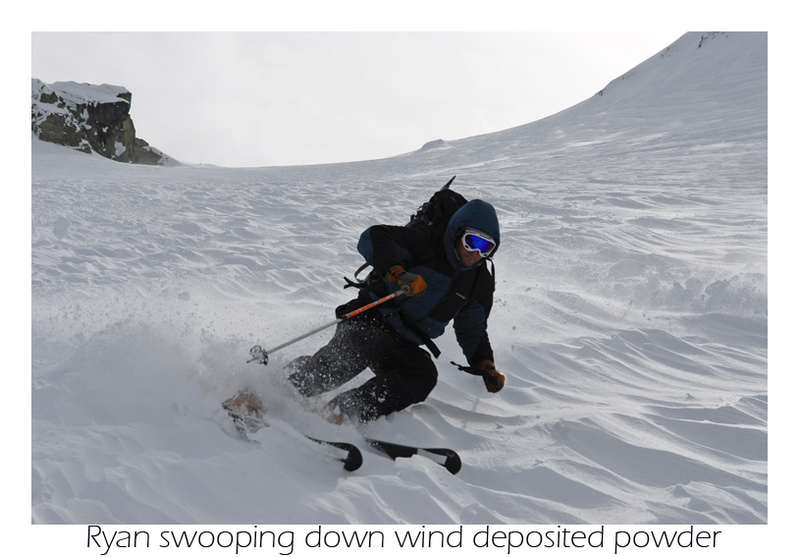 You are a true lover of the mountains and her whims then, getting a secondary and very practical education to boot. 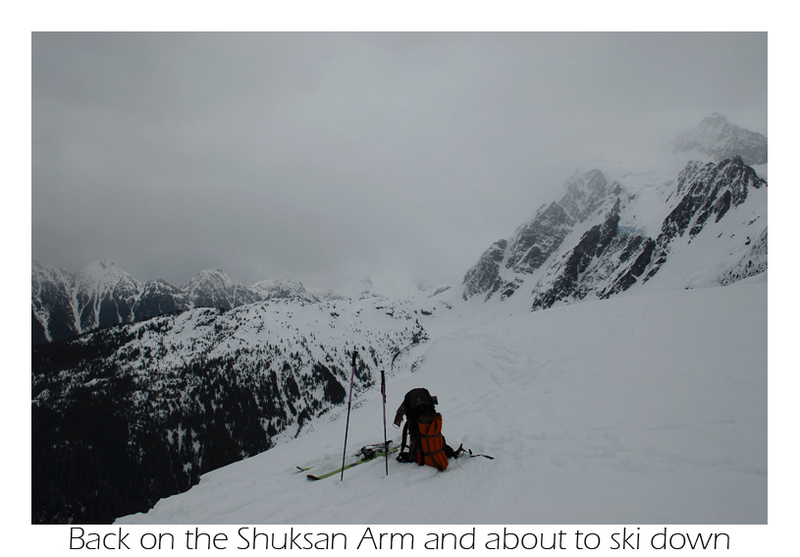 Once at Baker Ski Area we jumped the lift, headed out onto the Shuksan Arm and dropped down to Lake Ann where we set up camp. It was a brilliant day, perfect for chilling under sunny skies and discussing how lazy we are for not skiing. After a few hours we couldn't help but to get out and stretch our legs. That night I had hoped to take night pictures of the stars and Baker, but clouds blew in and obscured not just the stars but the sunset too. I was largely disappointed, as I can never get enough of either. Morning came at 3 a.m. much too early for this white collar worker, but this isn't work, this is fun, right (ask me in 3 hours)? The rain we feared hadn't materialized, so the game was on. In moments we were packed and ready to go. 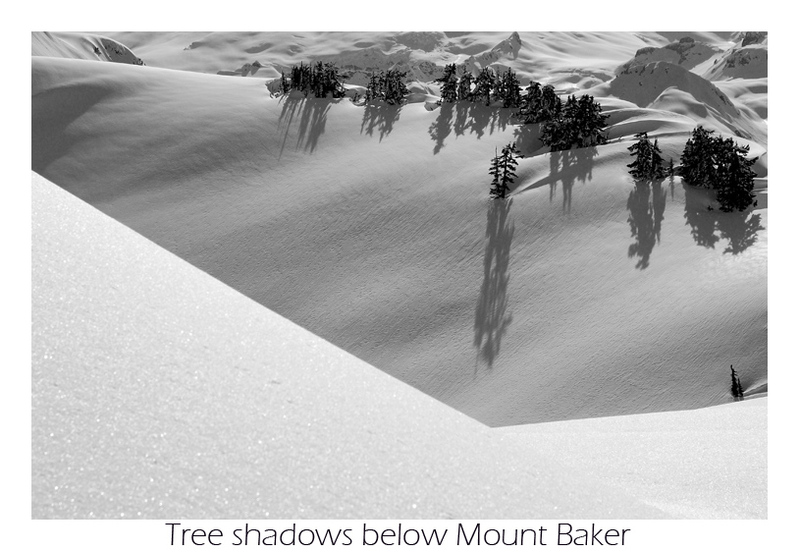 The trip began on scary encrusted snow and dropped into a steeper treed face. 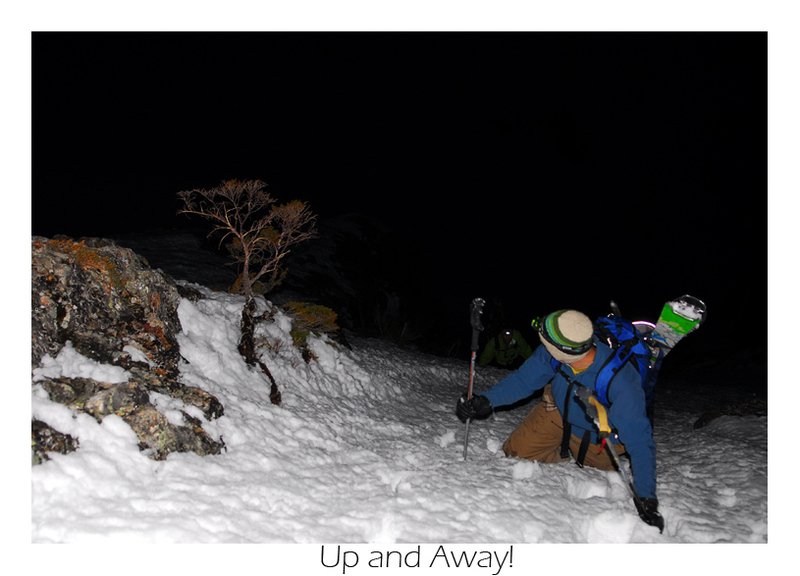 Since I was familiar with the way I led us down to the glacier and to the base of the route. 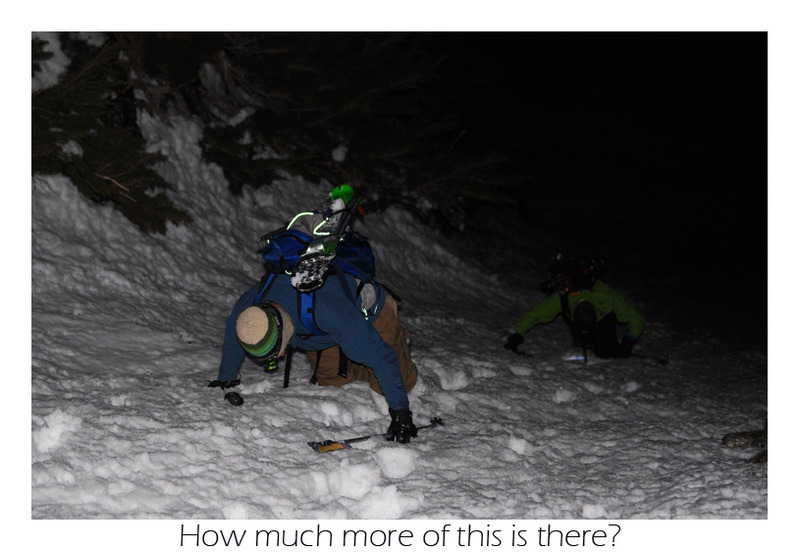 Here the climb began in deep manky snow which required many lead changes around cliffs, up couloirs and onto broad faces hemmed in by two distinct ridges. 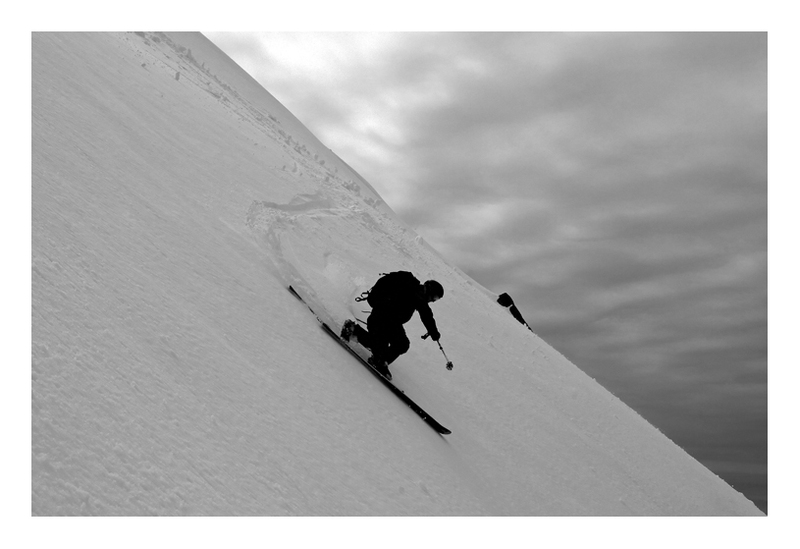 In places we were able to skin and in others it was too steep. Near the top of the route, I asked to take over the lead from Paul as I was excited to top the route. We kept our distance from each other for safety purposes. Eventually I was on top looking down. It was a great feeling and brought back fond memories. I couldn't help but think of my friend Ben. How that, so many times since his death, I have felt the memories shared ingrained in the places we'd been in the mountains. 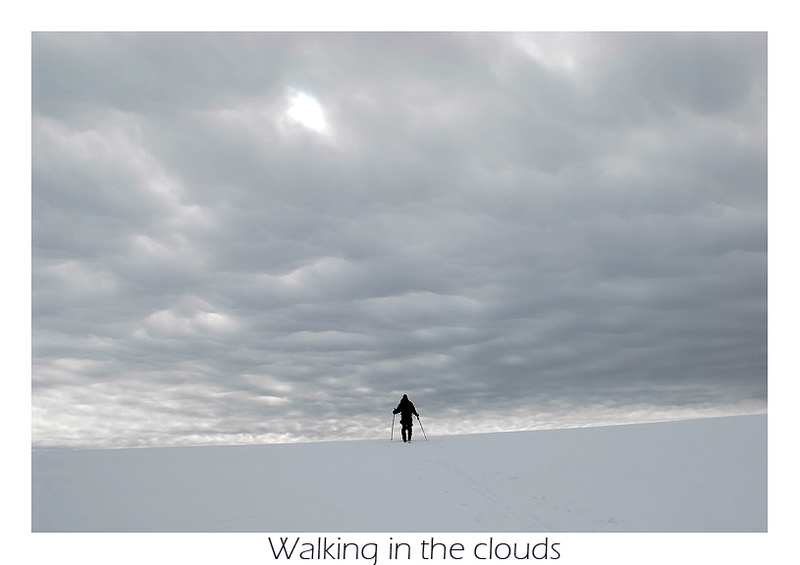 Wild clouds covered the sky all the way to the pickets and off toward Blum. 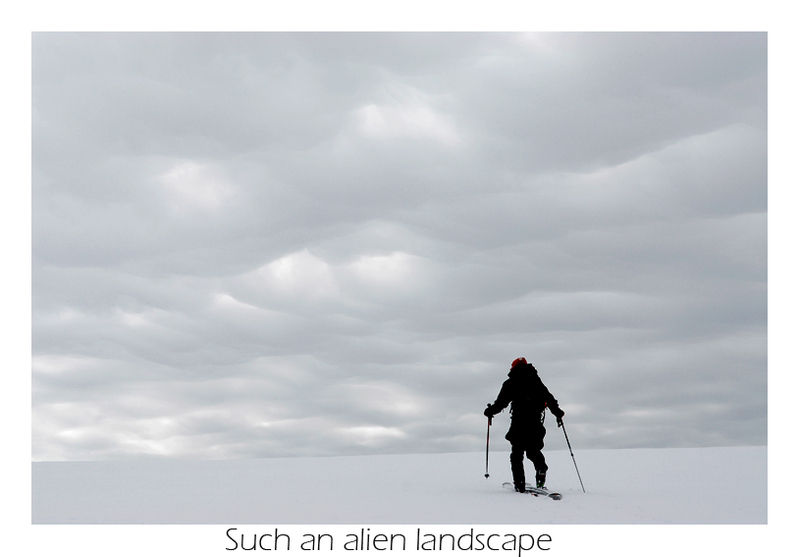 It was a wild sky-scape and made the mountains appear so much more surreal than they really are. For all the others, this was their first sight of these mountains and I believe they were left slack-jawed. I know I was, and I've seen it many, many times. 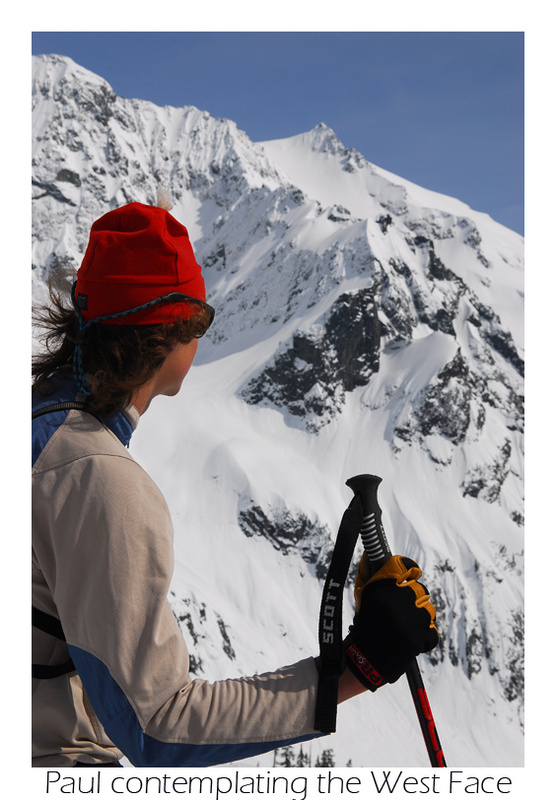 With rest we decided to climb towards the summit pyramid along the Sulphide. Given our time constraints we turned tail and headed down. We'd topped the route at 9 a.m. (approximately) and needed to get down before the entire west face turned into an avi-shooting death match that we were sure to lose. 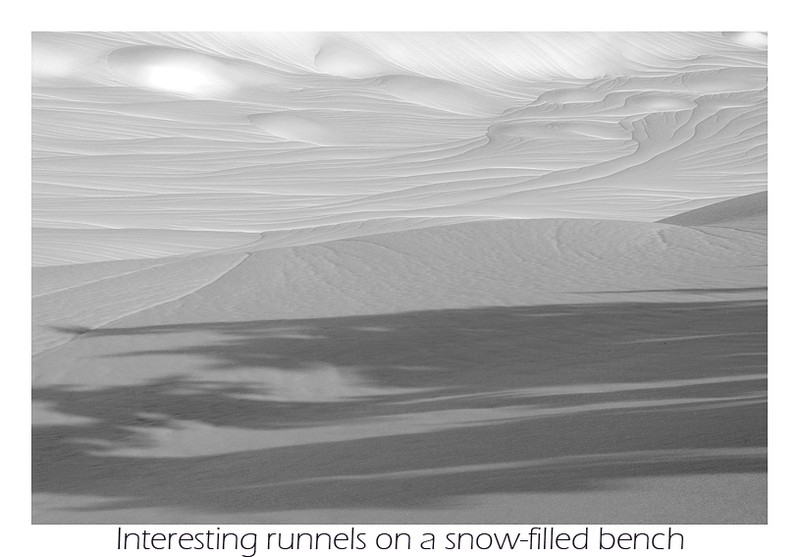 Steadfastly we gingerly took our first few turns and found better conditions than we expected. In fact I'd go as far as to say, "We had a blast." 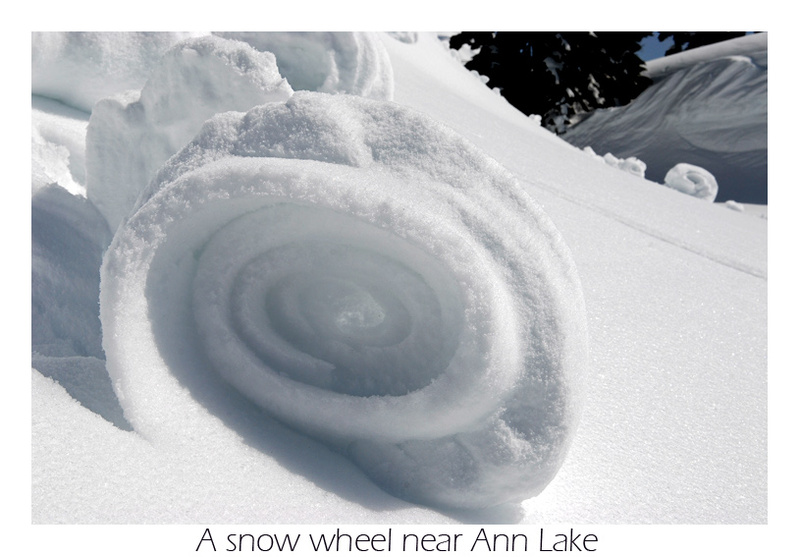 The snow was ego-dashing mank-crust on the way up. Given the clouds we hadn't expected it to soften. We mislead ourselves and low expectations can lead to our shattering them. This was great. There was plenty of sluff control that needed to be undertaken. On the upper face we didn't need to worry about it much, but lower down it was essential. 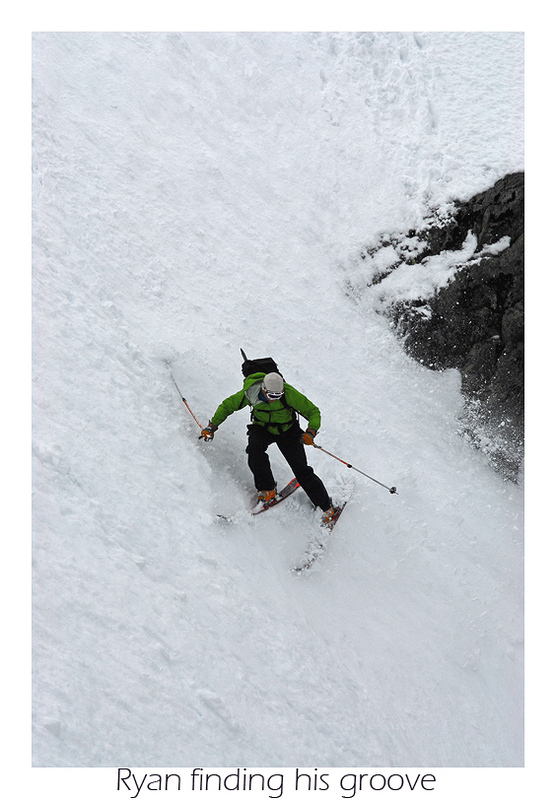 When we left the first couloir and dropped into a second, I took over and skied the route out to the bottom. From my safety zone I watched huge wet slides crash down the mountain. It was thrilling. I was down and everything was good in the world. In fact, all had gone to plan. Now all we had to worry about was getting back out of this valley. Imagined all along was armpit-deep post holing and sweat plastered, breath starved suffering for 1500-ft, certainly nothing to look forward too. With the others down and everyone safe, I continued across the glacier valley and traversed around to a place that looked good to climb back up to Ann Lake. My first few switchbacks had sent wet slides off. I was unhappy about that and was afraid it would continue, but it didn't. Once in the trees, all was safe enough and provided an enjoyable workout for me. I busted track all the way back out to camp and after packing, I continued all the way out to the Shuksan Arm where I waited for the others. 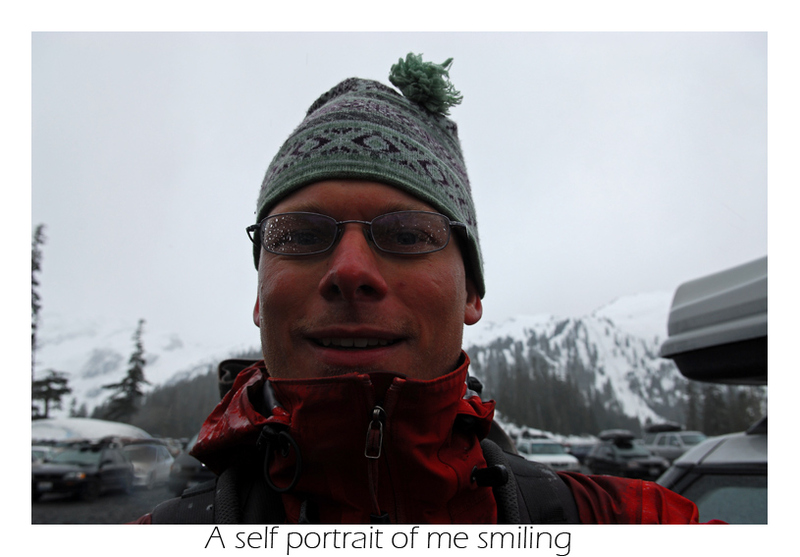 Soon all surrounding mountains were covered in rain squalls and I was antsy to leave. It wasn't long before my sucker hole was closed off and frozen rain began to fall. By the time the others arrived it had let up. From there, we skied down to the resort and out to the car. By then, all bets were off with the weather. When I reached the car, I was soaked! Now that's the way to end a trip. I couldn't help but crack a smile, my happy face. 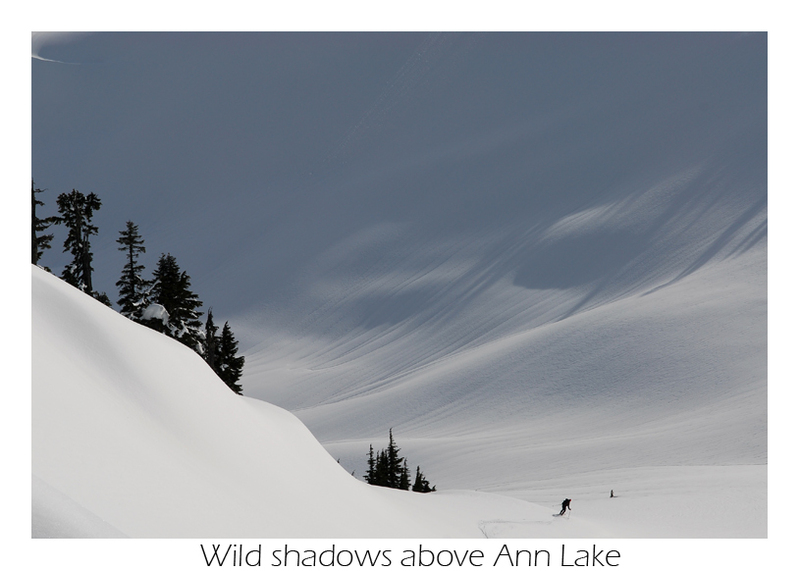 With the west face further explored and my penchant for good ski lines fullfilled, I was satisfied. What I had climbed and walked away from, had made an enjoyable adventure years later. Sometimes there's a right day and it's not always a bad idea to be patient and wait. Thanks for the trip Dave, Paul, and Ryan!